Ramon Margalef López, Professor Emeritus of Ecology of the University of Barcelona, Spain, passed away at age 85 on May 23, 2004. Ramon Margalef was the most important Catalan and Spanish limnologist, marine biologist, and ecologist of the twentieth century. He was a pioneer and outstanding researcher in these fields; and made great contributions to branches of science ranging from limnology and biological oceanography to theoretical ecology. Margalef has left us an enormous body of scientific literature, consisting of around 400 published articles and around 20 scientific books. Even though not all of his articles were published in journals included in the Science Citation Index, for many years he was the most frequently cited Spanish scientist. In a list of 95 investigators from around the world, Margalef was considered to be one of the three most outstanding Spanish life scientists-the other two being Nobel Prize winners Santiago Ramón y Cajal (1852-1934) and Severo Ochoa (1905-1993). Margalef's book Perspectives in Ecological Theory (1968) and his articles "On certain unifying principles in ecology" (1963), "Life-forms of phytoplankton as survival alternatives in an unstable environment" (1978) and "From hydrodynamic processes to structure (information) and from information to process" (1985) are classics regarding their citations by other authors. In particular, "On certain unifying principles in ecology" is considered to be among the top ten articles of twentieth-century biology. Ramon Margalef was born in Barcelona in 1919, and as a youth, as he later wrote, "lost time in Trade School and other foolishnesses". He studied French, German and mathematics, and soon thereafter he became interested in natural history and biology, especially in aquatic environments. The Spanish Civil War interrupted his education and, in 1938, while was still a teenager, he was recruited into the Republican army. At the end of the war, he was forced by the new government to serve an extended three-year-period in the military. Afterwards, he worked as a clerk at an insurance company while continuing his research on Iberian aquatic ecosystems as a student at the Botanical Institute of Barcelona. His training was mostly autodidactic, and he read everything he could find on biology, physics and other fields, which equipped him with an encyclopaedic amount of knowledge. His scientific wanderings surely account for his ability to synthesize information regarding the workings of nature. In addition, it later provided his pupils with unique access to a wealth of knowledge. In fact, for many years, at the University of Barcelona, the Department of Ecology had the most diverse library, including many books not exclusively pertaining to ecology. Margalef's earliest scientific publications, which date back to 1943, quickly established his talent and won him a scholarship, with which he obtained a degree in Biology. In 1951, he defended his doctoral thesis on "Temperature and morphology of living beings", which addressed many questions that nowadays are still being asked and in which Margalef was interested all his life. It is well known that, in the 1940s, Margalef constructed his own microscope with an assortment of parts that he had bought at flea markets. What is not so well known, however, is that, for years, he constructed several other instruments in order to automatically obtain plankton samples, mimic natural conditions in the laboratory, or to automatically process data from his experiments. He applied to ecology what had once been said about physics: "The good ecologist should be able to screw down screws with a hammer and to sink nails with a screwdriver." Proof of the high quality of his inventions (actual prototypes that were later modified and improved) was the fact that, for many years, the US government gave him-literally-a blank check to construct any kind of mechanical instrument he needed, devices that his colleagues referred to as "rain-producing machines". During that early period, Margalef was an indefatigable researcher. Not only was he an outstanding naturalist, but he was also capable of making connections between very diverse aspects of biology, geology, physics and chemistry. It was obvious that he had a rare intelligence, and that his knowledge exceeded by far that of his colleagues. Other scientists in higher positions were aware of the excellence of Margalef's work and helped him to pursue his career. He often mentioned the German amateur naturalist Karl Faust (1874-1952), a businessman who settled in Catalonia in 1898 and who founded the Marimurtra Botanical Gardens in Blanes, Costa Brava; the eminent botanist Pius Font Quer (1888-1964); the zoologist Francisco García del Cid (1897-1965), the first director-from 1951 until his death-of the Institute for Fisheries Research; and Miquel Massutí Alzamora (1902-1950). All of them offered him scholarships or helped him in his early research efforts. After World War II, Margalef met with an American talent scout who had come to Spain in search for gifted scientists. This meeting proved to be crucial for Margalef. The American offered him the opportunity of travelling without limits around the United States and to other countries. Margalef took advantage of the offer to visit numerous research centres and to participate in various scientific congresses. Several American universities offered him the opportunity to move to the United States with his family, an invitation he would have accepted gladly in order to leave post-war Spain, which he considered to be a "shrunken society" with respect to science. Nevertheless, the opinion of his wife-Maria Mir, also a biologist, whom he had married in 1952 and who died just a week after her husband-prevailed. She was from Majorca with strong personal ties to the island, and she considered the United States to be too far away from her homeland. In 1950, Margalef began working at the Institute for Fisheries Research (currently Institute for Marine Sciences), a division of the Spanish Research Council (CSIC), of which he was appointed director in 1966. Margalef promoted oceanographic research, and soon the Institute, which previously had focused its efforts mainly on fisheries, became a centre of research on oceanography. When, in 1967, he was appointed to Spain's first Chair in Ecology, at the University of Barcelona, he resigned his post at the Institute. At the University, Margalef established the Department of Ecology and trained several generations of ecologists, limnologists and oceanographers. After two decades of a fruitful academic career, he retired and was appointed Emeritus Professor. Without the time-consuming commitments of teaching and active research, he generously shared his knowledge with colleagues and friends until shortly before his death. Margalef trained hundreds of scientist in the classroom, in the laboratory, in the field, and at sea, lecturing them and carrying out joint research, not only at the University of Barcelona and the Institute for Fisheries Research, but also at other centres around the world. From 1971 to 2001, he directed around 40 doctoral theses, a number that does not do make justice to his generosity, enthusiasm and kindness when giving advice, or suggesting methods to tackle difficult problems or study unexplored fields of science. 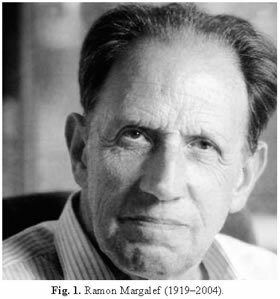 Both young researchers and those not so young, who over half a century were fortunate enough to benefit from his guidance, will surely always remember Margalef's unique approach to teaching and research. A prolific author, with good command of half a dozen languages (throughout his life, Margalef read thousands of scientific books, but he also had a notable literary knowledge, especially of the classics), he also taught through his books, which conveyed his ideas about the biosphere's organization and functioning both to university students and to society in general. Two remarkable university textbooks in Spanish written by Margalef deserve special mention: Ecología (1974) and Limnología (1983). For many years, Ecología was considered to be the best book on this field of science ever written in any language. Margalef updated the ideas contained in that book in later works: La Biosfera: Entre la termodinámica y el juego (The Biosphere: Between Thermodynamics and Game,1980), Teoría de los sistemas ecológicos (Theory of Ecological Systems, 1991), Oblik Biosfer (in Russian; A View of the Biosphere, 1992) and Our Biosphere (1997). Margalef was also author and editor of many monographs, including Introducción al estudio del plankton marino (Introduction to the Study of Marine Plankton, 1950), Los crustáceos de las aguas continentales ibéricas (Crustacenas from Iberian Freshwaters, 1953), Los organismos indicadores en la limnología (Indicator Organisms in Limnology, 1955), Comunidades naturales (Natural Communities, 1962), Ecología marina (Marine Ecology, 1967) and The Western Mediterranean (1985). Margalef was also a great popularizer of ecology. Among his books aimed at general audiences, a few must be mentioned: Ecología (Ecology, 1981), which continues to be a bestseller; L'Ecologia (Ecology, 1985), published in Catalan on the occasion of a related exhibit in Barcelona; and Planeta azul, planeta verde (Blue Planet, Green Planet, 1992). He was also a frequent contributor to several encyclopaedias of natural history, especially Història natural dels Països Catalans (in Catalan; Natural History of Catalan Countries, 1984-1992) and Biosfera (first published in Catalan, later translated into Japanese and English; Biosphere, 1993-1998). Margalef was a member of several academies in Spain and abroad, the National Academy of Sciences of the USA among them. He was an honorary member of various scientific societies around the world and was awarded Honoris Causa doctorates from several universities: Université d'Aix-Marseille, France (1973); Université Laval, Quebec, Canada (1987); University of Luján, Argentina (1994); University of Alicante, Spain (1999); and Sarrià Chemical Institute of the University Ramon Llull, Barcelona (1983). In science, receiving so many international awards is somewhat unusual. It is even more unusual that professional recognition continues over half a century. Margalef's article "The theory of information in ecology" (1957, originally written in Spanish) reached a worldwide audience. In that article, which was his introductory lecture as a new member of the Barcelona Royal Academy of Sciences and Arts (later published in its Proceedings), Margalef suggested that the theory of information should also be applied to the study of species diversity in ecosystems. Due to the novelty of Margalef's approach, it was translated into English and published in the journal General Systems (1958). At the time, ecology was still a young science, lacking both a theoretical reference frame and a corpus of stable paradigms comparable to those in other scientific fields. Margalef's 1958 article, along with the article "On certain unifying principles in ecology" (1963) and the small book "Perspectives in Ecological Theory" (1968), which was translated into several languages, offered a new and appealing way of understanding ecology. Margalef's based his theoretical approach, which was holistic and integrative, on his extensive knowledge of aquatic ecosystems. He had studied them first as a naturalist, applying a botanical, zoological and phytosociological perspective. Later, "tired of making lists [of species] to characterize different types of ecosystems", he took a more general approach and gathered information about the structure and working of the biosphere, which he considered "a multishaped cover of life above some heterogenic spaces that were also the matrix for evolution, and that were influenced by evolution itself in a feedback". The International Society of Limnology awarded Margalef the Naumann-Thienermann Medal for "having shared his creative talents of discoveries, intuition, and synthesis of the ecological foundations of the limnological phenomenon, and for his influence in the Hispanic world." Margalef, working on his own, set up the basis for studying the limnology of the Iberian Peninsula and the Balearic Islands, and initiated research examining one hundred Spanish dams, which thus far are the only thorough analyses of this type. The study of marine plankton and primary production of the sea soon led Margalef to new quantitative approaches and to applying several new methods of evaluating microbial populations along the water column, such as consideration of species diversity, or other models derived from terrestrial ecology, such as the concept of ecological succession. Probably his most outstanding contributions to ecology were recognizing the spatial organization of phytoplankton and the crucial role of auxiliary energy in such a structure. In fact, up until then phytoplankton was considered to be simply a cell suspension with no structure. Taking into account both space and the role of exosomatic energy in the structuring of biological communities was an approach that Margalef applied not only to the study of plankton, but also to other communities of the biosphere. This mode of thinking had proven to be advantageous when used to estimate species diversity and the connectedness between different nodes of trophic nets. It also enabled him to study the patterns that can be elucidated from ecological succession, which he first identified as an evolutionary framework in the development of the ecosystem. From these ideas, an ecological theory emerged that, like everything in science, has been subject to modification, refutation and evolution. This theory is Margalef's major contribution to ecology as an established scientific discipline. From his first publications on ecological theory until his last book, Margalef's role in furthering our understanding of biosphere functioning has been acknowledged internationally. In 1988, the National Science Foundation recognized Margalef's research on the dynamics of marine phytoplankton, which he carried out during the 1960s and 1970s. This body of work provided the foundations for subsequent biological research. Indeed, Margalef is one of the very few scientists who has contributed to both the theoretical and practical development of a science. Margalef excelled not only in the fields of limnology, marine ecology and theoretical ecology, but also in biogeography, geology, human evolution and human ecology. Including the human species in his general theory of the biosphere was among his most valuable but least known contributions to ecology. He also played a major role in the popularization of ecology: as mentioned above, he wrote several popular-science books, was the author of several encyclopaedias and participated in exhibitions designed for the general public. In one of his articles advocating changes in the teaching of natural science, he stressed the importance of conveying the "simple facts about life and the environment that one should not forget when preparing textbooks for our grandchildren." The cover of one of Margalef's books reproduces a fragment of a Catalan tapestry of the xvi century, in which a handcuffed elderly man seems to be studying some mollusc shells, unaware of the battle that is taking place around him. In the legend to the cover illustration, the author wrote that "to study the biotic diversity in the face of adversity, a lot of courage is needed." Margalef must have been referring to his own difficult first steps as a naturalist after the Spanish Civil War, in an atmosphere that was all but favorable to research, both in the laboratory and in the field. Nevertheless, the scene can also be interpreted differently. Naturalists have been criticized for their seemingly exclusive pursuit of their own, highly specialized interests, as well as for being apparently impassive to the usually very distressing events of this world, which they tend to ignore by isolating themselves in the ivory towers of academia. Margalef was not that sort of scientist. He did not ignore his social environment; on the contrary, he applied his knowledge of nature to gain a better understanding of the world that surrounded him. Stephen Jay Gould used to divide naturalists into two kinds: Galileans (from Galileo Galilei) and Franciscan (from Saint Francis of Assisi). Galileans delight in nature's intellectual puzzles, and the quest for explanation and understanding. They do not deny the visceral beauty of the world around them, but take greater pleasure in finding a scientific explanation for its wonders (Gould himself admitted to be an unrepentant Galilean). By contrast, Franciscan naturalists are the poets of nature; they exalt and indulge themselves in the beauty of nature with lyrical descriptions [Gould SJ. 1991. Bully for Brontosaurus. Reflections in natural history.WW Norton, New York]. Edward O. Wilson offered another perspective [Wilson EO. 1998. Consilience. The unity of knowledge. Alfred A. Knopf, New York]: the world, in all its multifaceted complexity, can be explained from the same general principles, mainly physical, which can be applied both to science and to humanities. He called consilience the key to a unified understanding of all that surrounds us. Ramon Margalef was both a Galilean naturalist and a consilient scientist.